"The Wire / The Demotion"
Is it just me, or did that just feel like... An actual TV show? With scripts and a director of photography and everything? Tonight’s pair of episodes—the first under new showrunner Paul Lieberstein, a.k.a. Toby from The Office, but also a.k.a. the guy who ran the NBC series for three variably successful late-life seasons—brings the previous version of Ghosted’s flaws into sharp relief. If the original show, with its obvious riffing, half-sketched plots, and indulgently loose editing, frequently felt like a first draft for another, better comedy, Lieberstein’s version comes a lot closer to that idealized finished product. Rather than rely on the idea that the chemistry between Scott and Robinson is strong enough to carry pretty much anything the show tries to heap on it, this newish series feels like it’s actually working to build a strong foundation to support its two talented leading men. “What if someone tried to buy wire hangers from the fake wire hanger company?” is already a fun premise—especially if, as Leroy and Max wryly note, we might be ditching the “monster of the week” format in favor of keeping the guys closer to home. But it’s the addition of Richardson, and Robinson’s back-and-forth with him, that really makes the episode work. One of the secrets of good comedy is that enthusiasm is almost always funnier than disinterest, and Sam’s wholehearted love of all things hanger makes him a delight to watch (while still leaving just a bit of mysterious edge about his actual motivations). The episode’s best moments come as Leroy throws himself fully into his “wire hanger salesman” persona, including a perfectly timed bit where Barry’s there to hand him stolen-from-the-closet “samples” the second he steps out of the Bureau’s elevator, while Sam patiently waits upstairs. While Leroy plays pretend, though, Max stumbles onto what feels like another big part of Ghosted’s new direction: A slight push toward serialization that comes in the form of mysterious wire running all through the Bureau’s headquarters, apparently listening in to everything the organization does (or doesn’t, as the last few months might suggest). What follows is some truly fantastic fake-awkward work from the entire ensemble (including the more-prominent-than-usual office drones) as they attempt to make small talk while following the wire’s path, eventually tracking it back to an abandoned taqueria. What could it possibly mean? I’m going to be brutally honest here and admit I don’t actually care all that much—this is never going to be a plot show, no matter how many mysteriously frying tortillas its producers care to show us. But it’s nice that the people making it at least seem to care that we have some stakes to hold on to, for once. That push toward plot takes a further backseat in tonight’s second episode, “The Demotion,” (Grade: B+) which sees yet another Veep supporting star wander in to make things tricky for the members of the BU. In this case, it’s the great Kevin Dunn, playing Merv (or possibly Marv) Minette, who promptly gives the titular title change to LaFrey, before seating himself in the Captain’s chair and ordering the wire investigation to be swiftly hushed up. Structurally, “The Demotion” is built around Minette’s introductory meetings with the rest of the team, and specifically Max, Leroy, and Annie. (Am I pissed that we don’t get more interactions between him and Barry? I will admit that I am pissed.) Unsurprisingly, straight-laced, counting-the-seconds to retirement Merv hates Max and loves Leroy—who can resist that handshake? Or that pout?—which introduces one of those “Max and Leroy have an easily resolved fight” things that are apparently being held over from Ghosted Mk. I. Happily, the easily-resolved conflict is, indeed, easily resolved, and the two end up staking out a P.O. box connected to The Wire, which leads to one of the funniest action sequences the show has ever pulled off. I’ll admit that I rolled my eyes a bit when the mysterious bag man the duo (and Barry) are watching got shot by a sniper. But then the sniper got tagged by a drone. And then the drone was blown up with a rocket launcher, fired from a van that quickly peels away, by which point I was cracking up at the conspiracy-tinged chaos on my screen. Bravo, nu-Ghosted team, for that little Rube Goldberg machine of death. Meanwhile, the biggest takeaway from “The Demotion” is the continued push to make the non-star BU members feel like actual characters, instead of simple background dressing. If I was feeling cynical, I’d harp a bit on how clearly Lieberstein is cribbing from the formula used in the second season of The Office—which similarly saw previously faceless players (including, to some extent, Craig Robinson) transform into vital parts of the show’s ensemble—but why crap on something that’s working, especially if it’s filling a desperate need in the show’s formula? 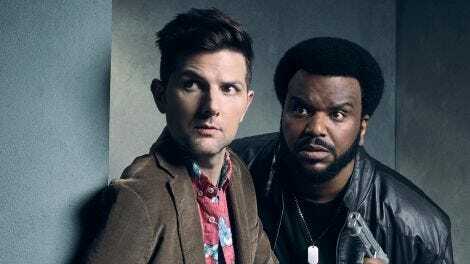 Ghosted’s five main characters used to feel like they were drifting in a void—it’s part of that first-draft floatiness I was complaining about before—but with just a few lines per episode, and strong, personality-filled performances from all of the background players (especially reformed Slipnutz member Andy Blitz as the raccoon-obsessed Bird), “The Demotion” quickly establishes that the Bureau isn’t just Max, Leroy, Barry, Annie, and LaFrey, but a whole crew of enjoyable weirdos. It feels alive, or, at least, like an actual goddamn TV show. Honestly, we were both kind of surprised. That “previously on” segment was a great reminder of how little I—or the show!—have really cared about any of the plot stuff that’s gone before. Max: “I ever tell you my grand philosophy?” Leroy: “You might have, I don’t know.” I might bag on this series some times, but I’ve missed these guys. I don’t entirely understand what’s going on with Annie and the cat, but it was a nice window into her particular strain of madness. All of the stilted fake small talk for the wire’s benefit was great, but Barry’s “You would notice a tornado; they are loud and they don’t care” was the star performer. How did I forget to mention Max’s magic show? I love that it didn’t pay off in any plot stuff, just Leroy’s delight at his later trick. Love the little runner about the employee (Sasha, I think?) who went to Burning Man under LaFrey’s nose. “If that card is up there, I swear I’ll scream. AAAAAAAAH!” Craig Robinson: National treasure. And that’s a wrap for this double episode, friends. I find myself in the rare position of feeling excited to see whether Lieberstein and his cast can keep this up for another week.